After their revelatory recording of Ravel’s Daphnis et Chloé, Les Siècles and François-Xavier Roth give us the exotic Mother Goose suite and Le tombeau de Couperin which sound so new thanks to this period-instrument guise (light on vibrato, and with instruments appropriate to the time of composition). Ma Mére l’Oye, with its unique colours, benefits most from this approach, less sweet than normal and always strikingly original. Le tombeau…, a work tinged with sadness, really does seem to reach back into the depths of French music, evoking a past age to remember the composer’s friends lost to the First World War. In this recording, its interesting to compare the two works for so-called small orchestra, Le Tombeau de Couperin and Ma mre lOye. For, when discussing Ravels orchestral music, one thinks more readily of the large symphony orchestra in all its luxuriance, of the teeming array of percussion, which often requires a timpanist and seven percussionists. In these two pieces, the orchestration is deliberately reduced, for two very different reasons. 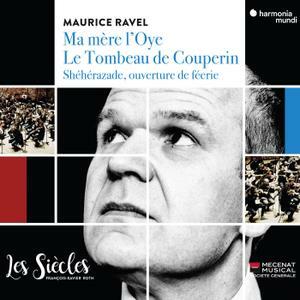 In one case, Ravel was writing with an eye to childhood indeed, to children themselves with Ma mre lOye; in the other, he was composing Le Tombeau de Couperin in homage to his friends who had been killed in the war. So were looking here at composition in two totally different sets of circumstances. Ma mre lOye is a cycle of pieces originally written for piano played by four childish hands. The version we have recorded with Les Sicles is an orchestration to which Ravel added transitions and a tableau (Danse du rouet et scne) in order to create a ballet, premiered in 1912 at the Thtre des Arts. Le Tombeau de Couperin is a tribute to French Baroque music, in which each piece clearly refers to a dance of that period. The French music of the seventeenth and eighteenth centuries had been brought back into fashion by Camille Saint-Sans, among others, shortly before Ravels musical education began. He seized on this repertory, and here he produced a work of an entirely novel kind. As is always the case with Ravel, each work is an experiment, a sort of unique diamond, without an earlier model. These are genuine tudes on Baroque dance, with each piece presenting a tempo, a rhythm, a melodic and harmonic language of its own, like an tude by Chopin. Imbued with nostalgia and great melancholy, but also vivacity and virtuosity, this music offers a new role to the wind instruments and especially the woodwind, which Ravel set about transcending. This new role for the wind instruments was of decisive importance in the evolution of their playing style in the course of the twentieth century. Shhrazade, ouverture de ferie is a more rarely performed work, because it dates from much earlier in Ravels career. Yet its very touching to hear the young composer writing for large orchestra in this overture and undertaking experiments with orchestral textures that he was later to use in Daphnis et Chlo or La Valse. Thanks to the Original ripper signeurAlfred !